The FDA has given personal genetics company 23andme 15 days to comply with health regulations, before the federal agency begins seizing the company's DNA testing kits. The FDA says 23andme is offering an untested "diagnostic" device in violation of the Federal Food, Drug and Cosmetic Act. For $99, 23andme will send you a DNA collection kit and sequence key regions from your whole genome. 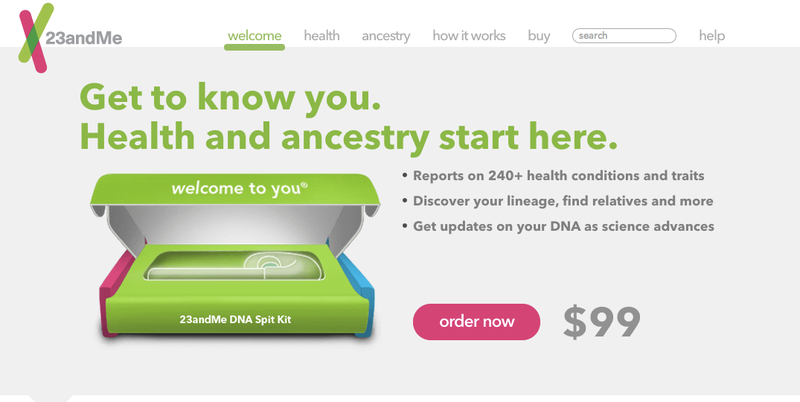 The company promises to reveal your potential health risks and assets, as well as ancestry information. For the past several years, the FDA has pushed 23andme to offer solid evidence that its kits work as advertised, and the agency says the company has done nothing to comply. It appears that talks between the company and the agency broke down, and 23andme has not been in touch with the FDA since May of this year. The FDA's main concern is 23andme's claim that it can offer information on medical conditions, which people may attempt to treat without medical supervision. One possible scenario is that people who take 23andme's test, and get a false positive, will seek out many other expensive medical tests and treatments (including surgery) that are unnecessary. Alternatively, people may be falsely reassured by a 23andme test that suggests they have no predispositions for genetic disease, and not heed health warning signs when they develop. Specifically, the FDA highlights "the potential health consequences that could result from false positive or false negative assessments for high-risk indications such as these." As one example, the FDA points out that a false positive for breast or ovarian cancer could "lead a patient to undergo prophylactic surgery, chemoprevention, intensive screening, or other morbidity-inducing actions." On the opposite end, a false negative could "result in a failure to recognize an actual risk that may exist." The idea of patients self managing any conditions they may have without a doctor's input seems to be a major concern for the FDA. "The risk of serious injury or death is known to be high when patients are either non-compliant or not properly dosed; combined with the risk that a direct-to-consumer test result may be used by a patient to self-manage, serious concerns are raised if test results are not adequately understood by patients or if incorrect test results are reported." Doctors associations have echoed these complaints in recent years, fearing that patients aren't able to properly interpret all that these saliva kits tell them. Direct-to-consumer genetic tests have already been banned in New York and Maryland as a result. One of the FDA's repeated requests has been that 23andme must adequately demonstrate the accuracy of its tests. This FDA move may have implications for other genetic testing services, and possibly services that test the human microbiome as well. Read the FDA's full warning letter to 23andme, where it issues its 15 day ultimatum.